A hi-tech glove that can tell people exactly how to play songs on a piano could dramatically improve treatments for people with motor difficulties. Georgia Tech researchers say their musical glove can improve sensation and motor skills for people with paralyzing spinal cord injuries. The gadget has already had a major impact in trials with individuals with limited feeling or movement in their hands due to tetraplegia. 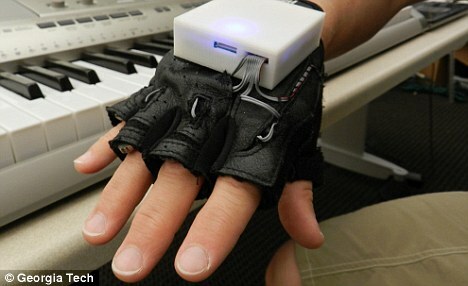 The glove is called Mobile Music Touch (MMT), and is used with a piano keyboard. The glove vibrates a person's fingers to tell them which keys to play. These researchers tested the glove with individuals who had sustained their injury more than a year before the study, and was primarily used while the participants were going about their daily routines. The eight-week experiment required participants to practice playing the piano for 30 minutes, three times a week. Half used the MMT glove to practice; half did not. While learning to play the instrument, several people with SCI experienced improved sensation in their fingers. 'After our preliminary work in 2011, we suspected that the glove would have positive results for people with SCI,' said Ph.D. graduate Tanya Markow, the project's leader. The glove works with a computer, MP3 player or smart phone. The musical glove with its control box. 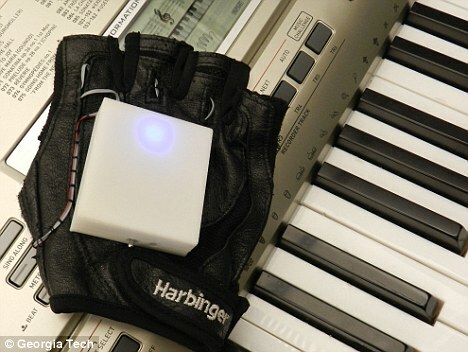 A song, such as Ode to Joy, is programmed into a device, which is wirelessly linked to the glove. As the musical notes are illuminated on the correct keys on the piano keyboard, the control box on the back of the glove sends vibrations to "tap" the corresponding fingers. The participants play along, gradually memorizing the keys and learning additional songs. The participants also wore the glove at home for two hours a day, five days a week, feeling only the vibration (and not playing the piano). Previous studies showed that wearing the MMT system passively in this manner helped participants learn songs faster and retain them better. The researchers hoped that the passive wearing of the device would also have rehabilitative effects. At the end of the study, participants performed a variety of common grasping and sensation tests to measure their improvement. Those who used the glove performed significantly better than those who just learned the piano normally. The team now hope to expand the study to include functional MRI results to see exactly what the effect of the glove is.